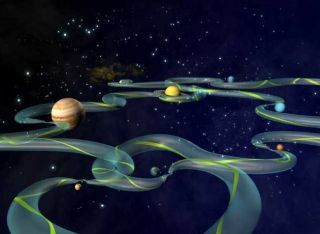 An artist's concept of interplanetary superhighway with travel lanes. Gravitationalcorridors describe minimum energy pathways between objects in the solar system;they connect Lagrange points where gravitational forces balance out. They werefirst investigated by Jules-Henri Poincar?, the French mathematician, in the1890's. These twisting, ever-changingpathways provide low speed but highly fuel efficient paths between planetsand moons. They create what some call an Interplanetary Transport Networkconnecting all of the major bodies in the solar system. He hadtravelled the space-lanes of the solar system for the greater part of his life,and now all of his time-honored rules of interplanetary navigation had beenupset by this new cruiser. Commuteships roared on all sides, as Ed Morris made his way wearily home to Earth atthe end of a long hard day at the office. The Ganymede-Terra lanes were chokedwith exhausted, grim-faced businessmen; Jupiter was in opposition to Earth andthe trip was a good two hours. In more modern sf movies,you might want to use a stellarcartography room, like the ones depicted in Star Trek: The Next Generation,to plot these routes. Hardy spacefarers eager toply the gravitational corridors between the Earth and Mars in real life shouldbe prepared for a long voyage, though; it could take thousands of years. Thebest use for these "space-lanes" is as low-consumption routes betweenthe moons of a planet like Jupiter. One example of a real-lifespace voyage to use this method was the Genesisspacecraft launched in 2004 to capture solar wind particles and return withthem to Earth.